When I found this Peanut Butter from Peanut Butter & Co. I was THRILLED. It looked so tasty (and it is!) and would (hopefully) satisfy my chocolate craving in a positive way (it does). The ingredients: peanuts, evaporated cane juice, cocoa, cocoa butter, organic palm oil, vanilla, soy lecithin and salt. It is GLUTEN FREE, Certified Vegan, has no hydrogenated oil, and no refined sugar. The best part is that this peanut butter tastes so darn good! I’m enjoying it on whole grain toast every morning and the kids love it on crackers, bananas, and apples. There are 170 calories and 13 grams of fat in a 2 tablespoon serving, this is comparable calorie-wise to regular peanut butter and has less fat (without being a fake reduced fat peanut butter!). Today I used this spread as a last minute frosting for a gluten-free/vegan cupcake I sent to school with my six- -year-old (there is a birthday in class today which means traditional cupcakes were brought in). I try to keep unfrosted gluten free/vegan cupcakes in the freezer at all times for occasions such as this. We will use up our last one tomorrow for a delayed holiday/now winter party that was rescheduled due to snow. 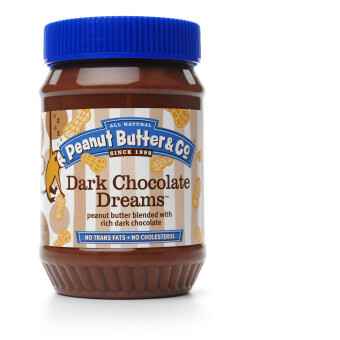 Guess I need to get baking… hmmmm, I bet this peanut butter would be delicious as a filling surprise inside cupcakes. The All Natural Peanut Butter & Co. nut butters will run about $6.00 for a 16oz jar. They are worth it! Also available in: Smooth Operator, Crunch Time, Cinnamon Raisin Swirl, The Heat Is On, White Chocolate Wonderful, The Bee’s Knees, and Mighty Maple. Remember to follow your Doctor’s recommendation for starting baby on nut products. If there is a history of nut allergies, many Doctor’s recommend waiting until age four.